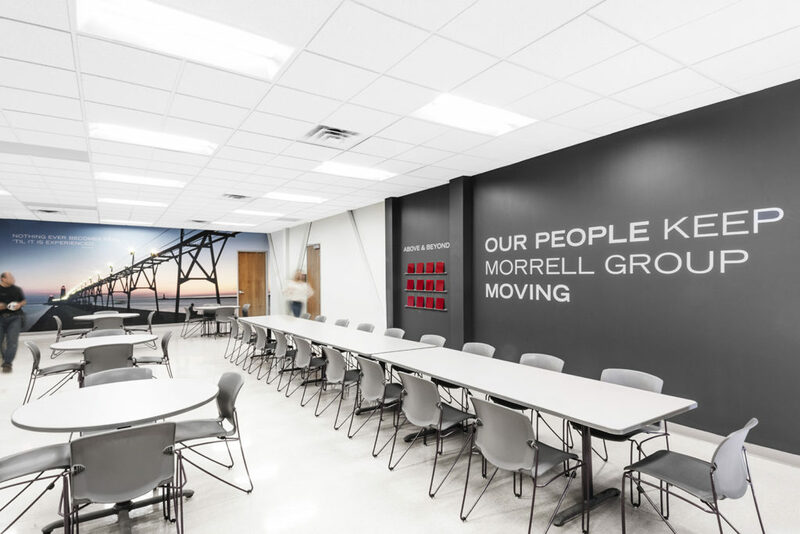 Morrell Group, a Michigan-based manufacturing and engineering firm wanted the interior design of their Auburn Hills headquarters to help increase sales and recruit top talent. They were speaking our language. 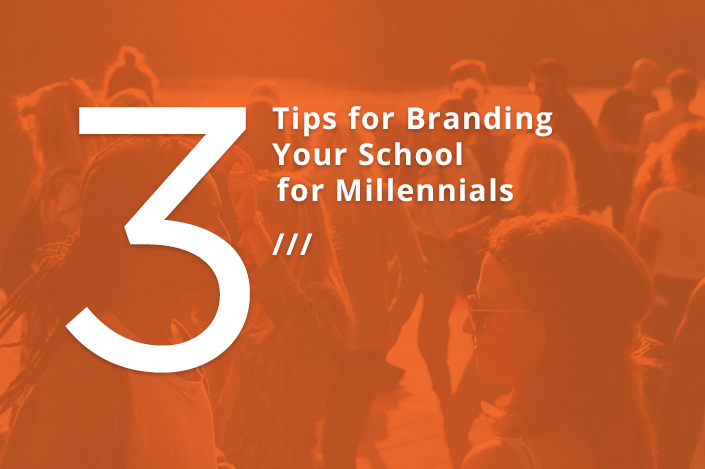 We call it space branding and storytelling and we were excited to partner with them to accomplish these goals. With roots in parts distribution, Morrell has grown through multiple company acquisitions into the Morrell Group, a company capable of providing fully-engineered and manufactured solutions in multiple industries. Simply put, many of their customers did not comprehend all that the Morrell Group was capable of solving for them. 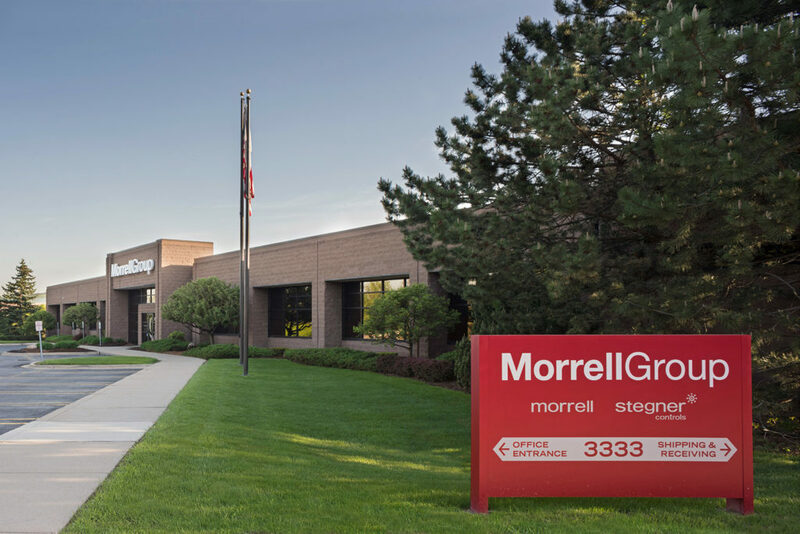 As existing and prospective customers regularly toured the Morrell Group Headquarters in Auburn Hills, Michigan as part of their buying process, this facility was the perfect place to tell the full story. 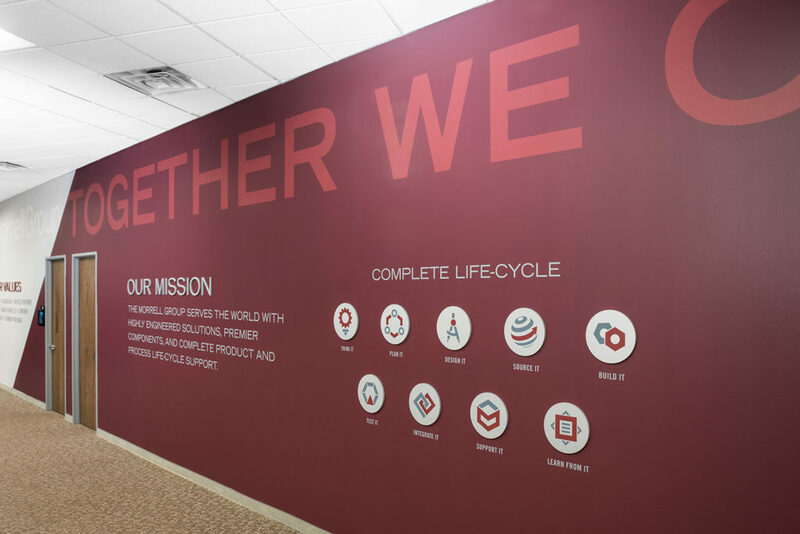 A tour of the facility would begin in the Sales and Project Management workspace, where we communicated Morrell Group’s mission, values, and complete life-cycle capabilities. We integrated custom icons to represent the capabilities offered by Morrell Group as a whole. 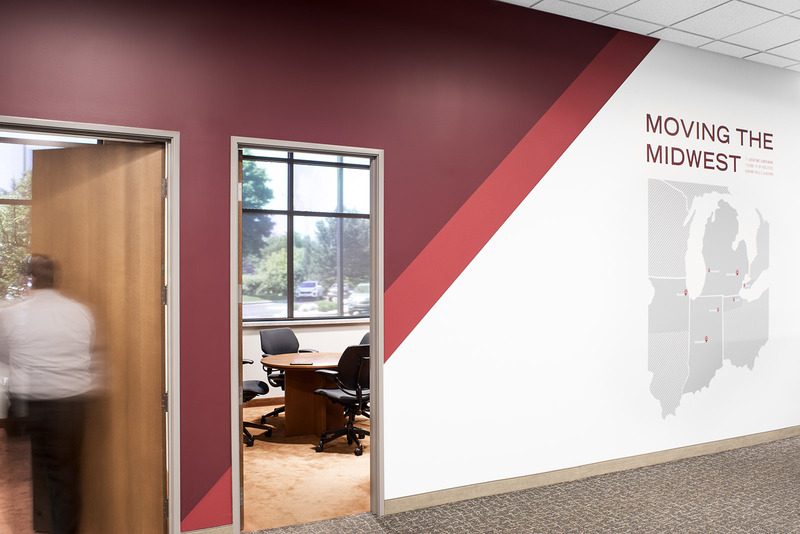 To break up the white space on the walls, we used graphics to showcase the Morrell Group locations across the Midwest. This allowed visitors to see that Morrell Group was more than just the one location they were touring. A designated Solutions Center was created to showcase components and engineered solutions. 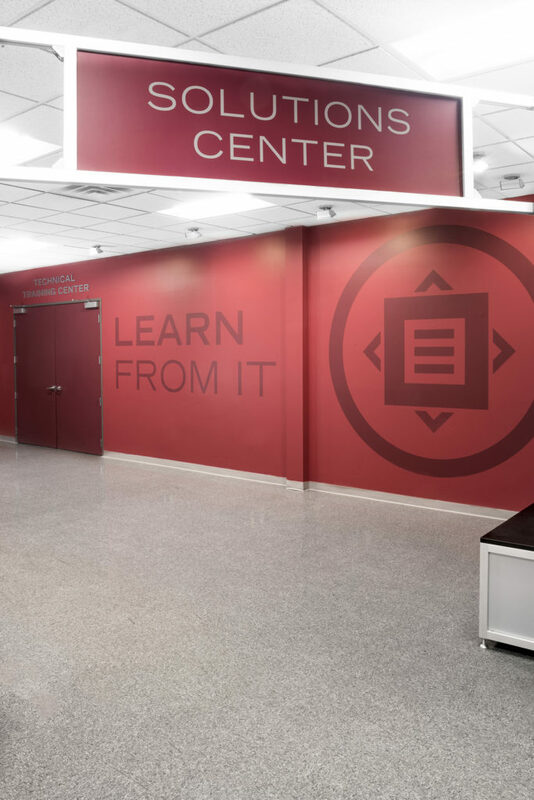 Large lettering and environmental graphics formalized the entry to the space and added excitement. 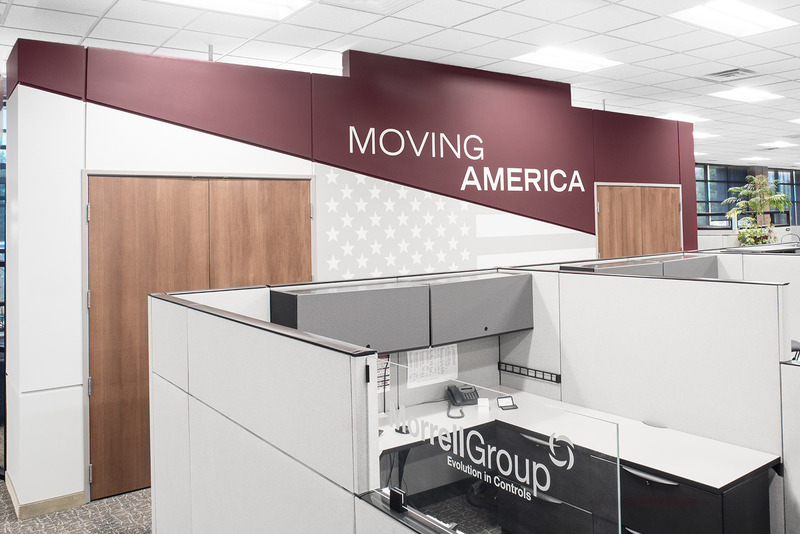 The Solutions Center offers guests the opportunity to discover examples of real-world solutions that Morrell Group has developed in a museum-like environment. 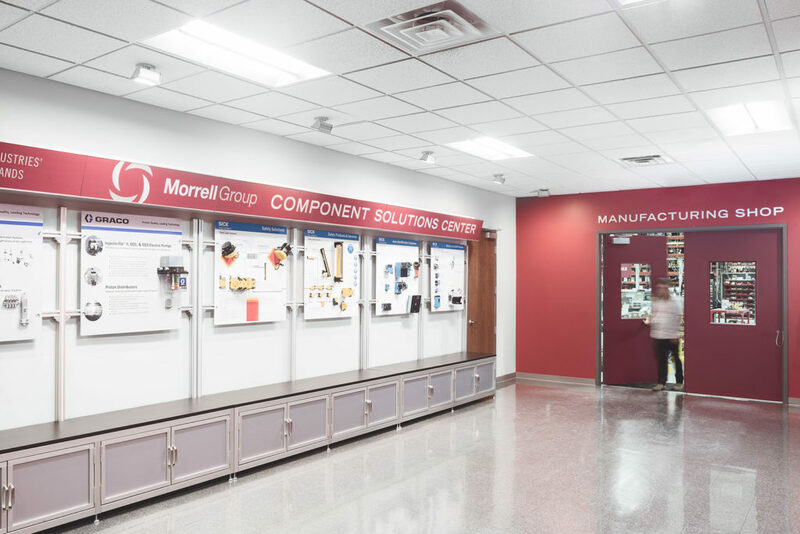 Each of the different brands utilized by Morrell Group is showcased in such a way that visitors can see how the individual components contribute to the overall solution. A tour through the shop floor was used to further open guest’s eyes to the more expansive solution set that Morrell Group was capable of delivering. The company competes for top talent in both engineering and manufacturing. They want prospective employees to feel that their company is a “cool place to work” while communicating their strong history, innovations, and marketplace strengths. 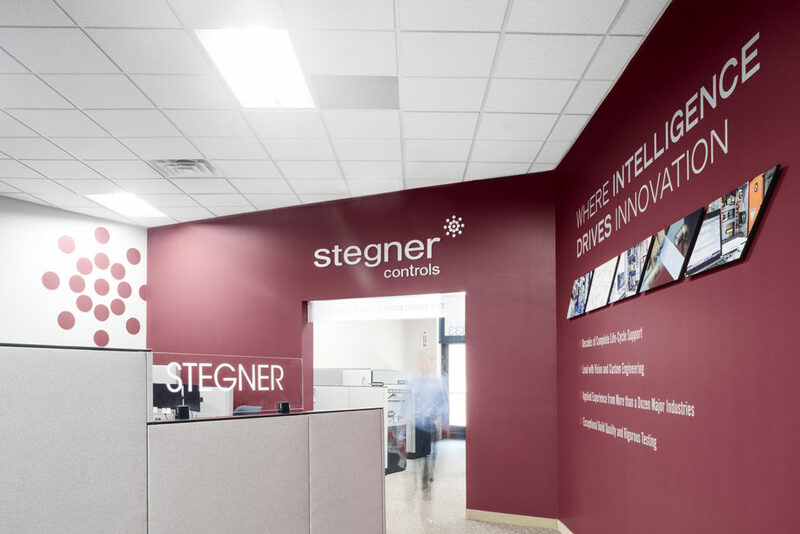 The new reception area was marked with the company logo and brand color. Custom artwork was selected to reflect the brand’s emphasis on motion and bring a level of sophistication to the space. During the Discovery process, we uncovered a literature room that had outlived its usefulness. Racks of unused brochures were using up space. 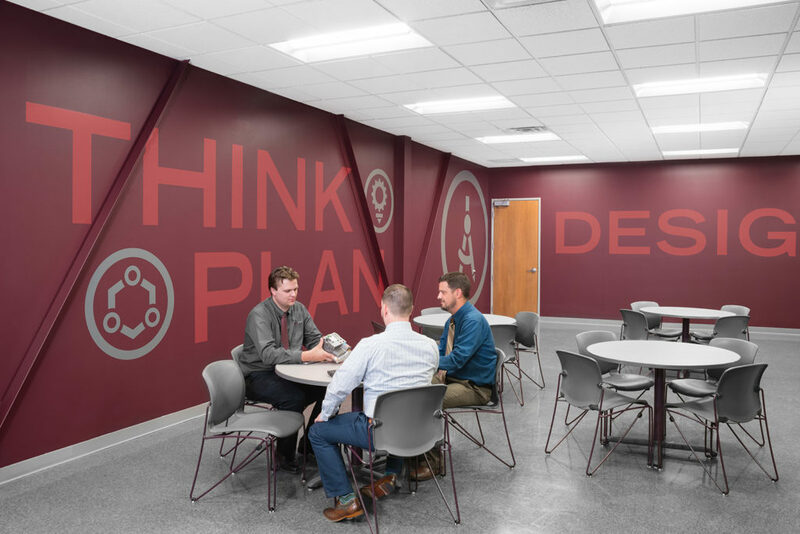 We recommended the repurposing of this room as a collaboration lounge, a designated place where teams could come together to solve customer challenges, a place less formal than one of the conference rooms. 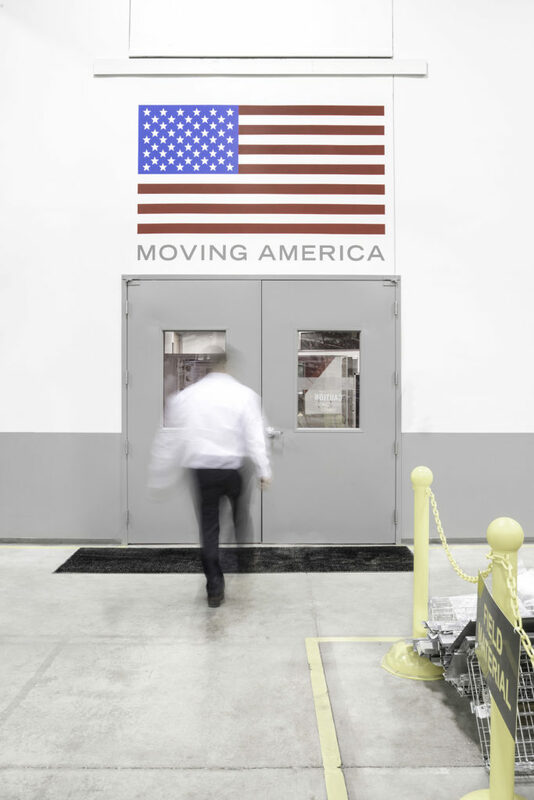 Brand messaging such as “Moving America” was coined and brought to select areas to spotlight the company’s national impact and promote pride. 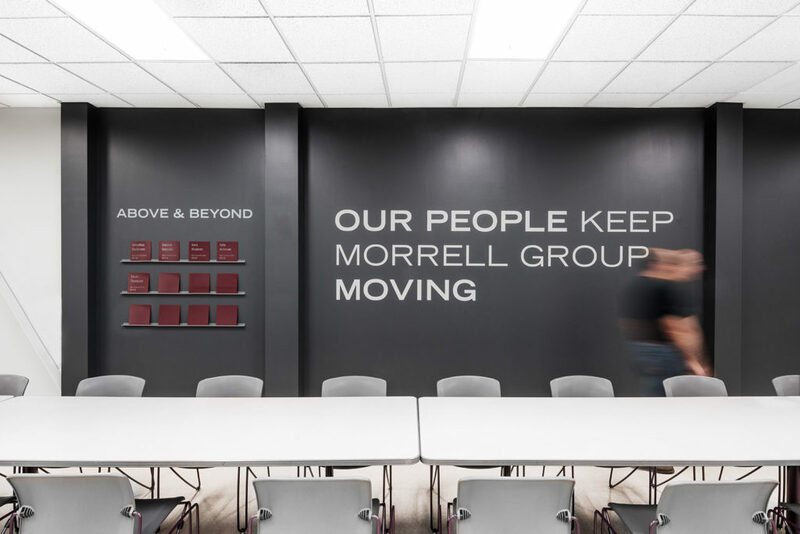 A mural, brand colors, and messaging in the Break Room emphasize the most valuable component of Morrell Group – its people. To further make the point that their team members are important, significant employee achievements are recognized in the Break Room. As we mentioned before, Morrell Group evolved through the acquisition of multiple companies. As a result, not only customers but employees often identified with the individual brands. The goal, however, was to bring everyone together as one, developing and delivering solutions that involved the group. 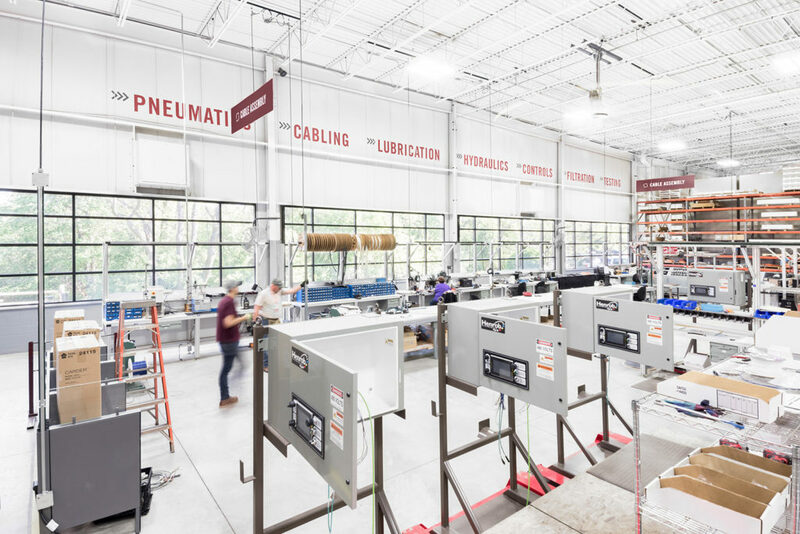 We emphasized the power of the unified company by using large messaging in the manufacturing shop. While sub-brands continue to exist in the marketplace given their name recognition, we designed a hierarchy that shows they are clearly part of the Morrell Group company. Consistency was brought to the sub-brands through typography and icon treatment to level the playing field. We also brought this brand hierarchy to the conference rooms. 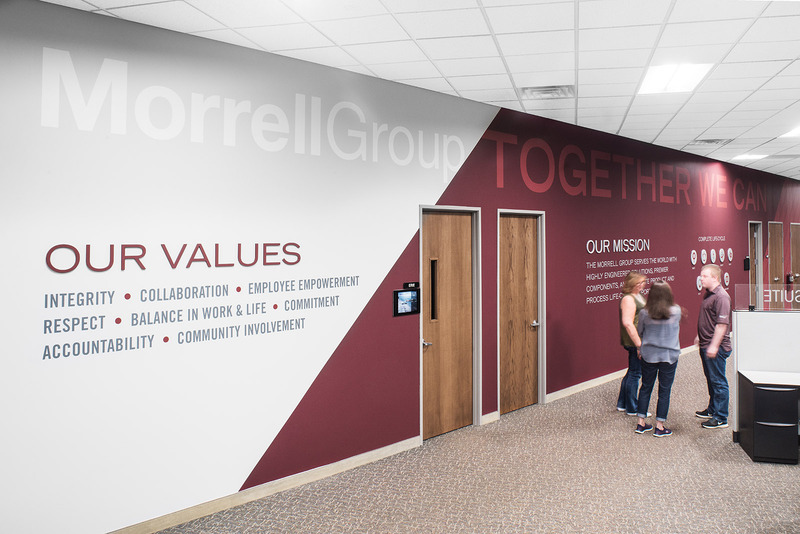 We further strengthened the identity of Morrell Group by designing their mission, values, and cross-brand capabilities into the main office area and other areas of the building. Branded spaces include both the interior and exterior of a building. Exterior signage extends the brand identity to the outside of Morrell Group’s building. 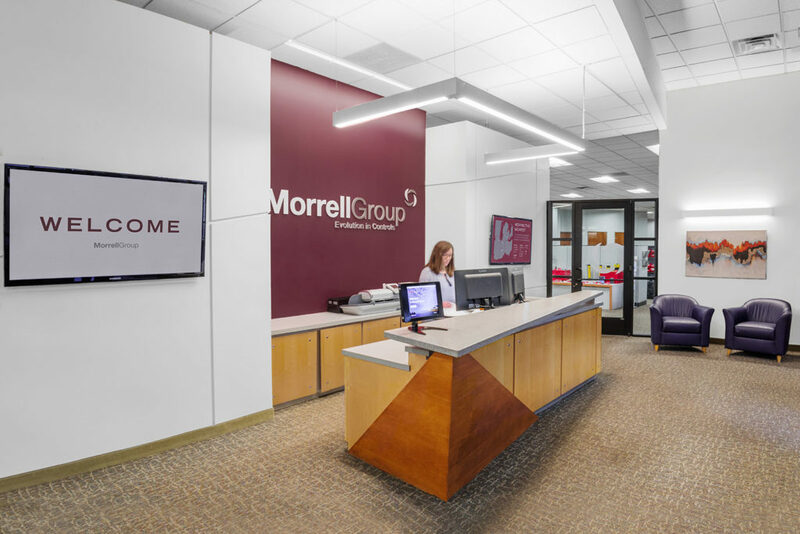 “We originally contacted Ideation as we were looking for a company to help better explain Morrell Group to the people visiting our building. 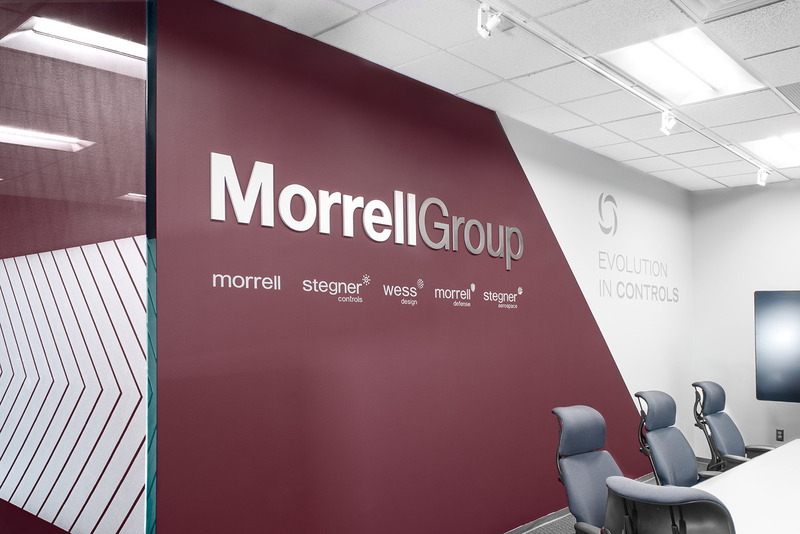 Prior to working with Ideation, it was hard to determine what Morrell Group does when in our office space and conference rooms. Jon and Michael took the time to listen to our story and how we wanted to show our company to our customers and vendors. We worked with the Ideation team over the following weeks and months to pull together all of these details and they presented their vision for our office. Ideation is an industry leader in branding spaces using interior design, signs and environmental graphics. If you would like more information on how your space can help you achieve your goals, contact Ideation Signs & Communications in Royal Oak, Michigan.